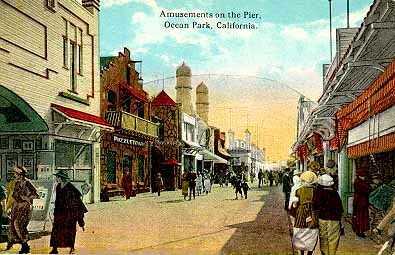 After the disastrous 1912 fire, rebuilding Ocean Park's amusement pier was the highest priority. But the new amusement pier was put on hold while the city of Santa Monica attempted to gain control of Fraser's beach frontage at the foot of Pier Avenue. Fraser was so discouraged after a four month long battle that he was packed and ready to leave for Panama when local businessmen urged him to proceed with his new pier plans. Finally on January 25, 1913 he announced that he would build a fireproof pier out of steel and concrete. It would be 285 feet wide and 1000 feet long and be ready by May 15, 1913 for the summer season. The State Amusement Company run by Ernest Pickering signed a long term lease to operate the pier's amusements. In April Santa Monica filed an injunction to stop Fraser from building his pier. The city claimed that they owned 42 feet of ocean frontage at the foot of Pier Avenue, which in their eyes was merely an extension of the street. Fraser had previously given the city an easement to extend a sewer outfall there, but didn't deed them the land. Actually the injunction only prevented Fraser from building his pier entrance buildings adjacent to Ocean Front Walk. He was able to continue construction by setting the pier pilings further out on the beach than he intended. The pier was rushed to completion and reopened on May 30, 1913. It was a much simpler design with a broad boardwalk running down the center of the pier. Various rides, booths and concessions were on either side. Many of the attractions on the old pier were rebuilt. The 200 x 230 foot Dance Hall stood on the ocean end. Bowling alleys and billiard hall were adjacent to it, and beyond was the Rosemary Theater. Other attractions included a Parker Carousel, Crazy House, Breaker's Cafe, Crooked House, Petite Theater, Roller Skating Rink, City Jail, Baby Incubators, Puzzletown and Mystic Maze. While the pier lacked thrill rides its first season, it did attract its share of dollars. Fraser finally won his court case against the city of Santa Monica in 1914 and was able to build at his pier entrance on Ocean Front Walk. He rebuilt his Casino. Promoters were able to successfully raise money to build the Ben Hur Racer on the north side of the pier. The three-in-one project contained a big racing roller coaster, a 7000 seat bandstand and a large carousel within the structure. The 75 foot high coaster that extended 700 feet out into the ocean began operating in late summer. A fire broke out in the Dance Pavilion at the seaward end of the Fraser Pier at 1 A.M. just as Christmas ended. The night watchman discovered the blaze in the check room and immediately called for help. 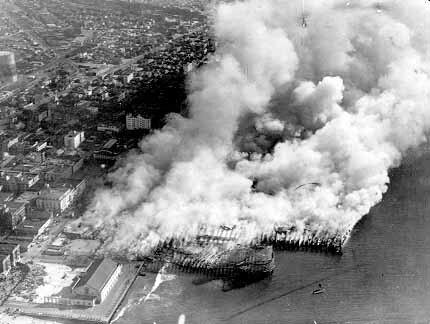 The fire, fanned by a slight breeze, began its march up the pier. It consumed the Pioneer Bowling Alleys, Eskimo Village, Paris by Night, numerous concession booths and half the Ben Hur roller coaster before the combined fire fighting brigades of three beach communities stopped it behind the Rosemary Theater. The State Investment Company immediately built a small temporary dance hall. Once it was open on February 12, 1916, business receipts improved dramatically. Their permanent dance hall at the end of the pier reopened on Easter Sunday. Meanwhile investors leased space on the adjacent Great Western Pier across the Venice boundary line and built adjacent to Ocean Front Walk, a huge dance hall under a 100 foot diameter concrete dome. It opened on July 4th. Tom Prior and Fred Church leased space on Ocean Front Walk between the Fraser Pier's two entrances. Their new building housed a Great American Racing Derby. The inside portion of the ride was a standard carousel. However, on the outside rim of the 72 foot diameter machine were forty racing horses grouped in ten distinct races. The horses, which were set in six foot long tracks, would move back and forth as the ride rotated, sometimes moving ahead, other times suddenly falling back. The winners of each race would receive free repeat rides. While it was scheduled to open in the summer, delays in manufacturing the custom horses, prevented completion until February 1917. 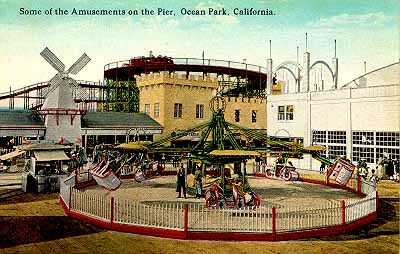 Since Tom Prior claimed that Santa Monica's restrictions against games of chance were bad for business, he removed the ride in January 1918 and attempted to demolish the building. W.H. 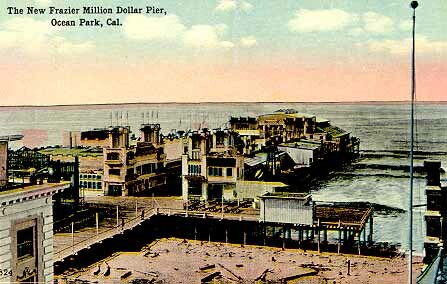 Labb and William Ellison took over the management of the pier in 1918, but by 1919 Ocean Park concessionaires became extremely unhappy with them. They and local business owners demanded that they advertise, put in real attractions and decent entertainment on the pier. They didn't have to wait long because Ernest Pickering purchased the pier on July 2, 1919. He left immediately for a tour of East Coast amusement parks to procure the newest and best rides for his pier. Construction began in March 1920 on the expansion of the Pickering Pier and the addition of five exciting new rides. He doubled the size of his pier to 400,000 square feet (The Abbot Kinney Pier was only 250,000 square feet). Leonard Crandell, who had operated the Venice Scenic Railroad and planed to move it to Ocean Park, decided instead to design and build a new racing roller coaster on the old Ben Hur site. His new Blarney Racer wasn't very fast and unfortunately never made its money back. It shared the site with a Ye Old Red Mill boat ride, a the Monkey Speedway Auto Races. Pickering rebuilt and enlarged the pier's Crakerbox Dance Hall and placed new rides near it. These included the Captive Aeroplane, Tango, Over the Top rides. Other rides placed elsewhere on the pier included the Frolic, a Dentzel Carousel, Over the Rockies, a shooting gallery and the Bug House. Everything was ready in time for its June 18, 1920 grand opening. 25,000 people came on Saturday and 60,000 people on Sunday. Business was great that summer and Pickering paid his investors a 1% monthly dividend. Ocean Park got a big boost in September 1921 when Charles Lick, Austin McFadden and George Leihy invested $250,000 to construct a new pier seaward of the Dome Dance Pavilion. The proposed Lick Pier at the foot of Navy Street adjoining the south side of the Pickering Pier was almost entirely in Venice. It would be 800 feet long and 225 feet wide. When it opened in Easter weekend 1922 it had a 22,000 square foot Bon Ton Ballroom, a Zip roller coaster, a Dodge'em, Caterpillar and Captive Aeroplane rides. Pickering only added a few new rides for the 1922 season; a Witching Waves and Double Whirl rides. But for the 1923 season he added a Whip ride and hired Prior and Church to design a new "Bobs" style twister coaster for his pier. The new 85 foot high Giant Dipper roller coaster with its steep 55 degree drop opened in time for Memorial Day. It was one of the most spectacular roller coasters of its time, much more terrifying that the one they built on the Venice Pier. Unfortunately the new roller coaster didn't last very long as a fire on Sunday morning January 6th destroyed the pier. Although the fire started at 9:30 A.M. in the Ritz Cafe kitchen, it didn't explain how the fire spread so quickly. Some thought that rubbish was set ablaze beneath the pier near the restaurant. When fire fighters arrived, they laid hoses, but before the water could be turned on, flames burst up from beneath the pier and the hoses burned. Another fire truck broke and the water stopped. The wind was blowing and it looked like all of Ocean Park was threatened. Rumors that they were going to use dynamite scattered the huge crowd that lined up on every street and on the beach to watch. Ten fire companies fought the blaze. Luckily the Dome Theater's concrete structure at the northeast corner of the pier contained the fire, and prevented it from leaping across Ocean Front Walk. The fire was contained by 11:45 A.M. The losses were enormous, $2,000,000 with only $100,000 insured. 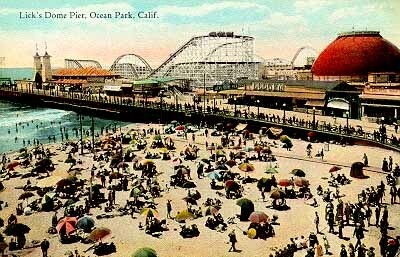 Both the Rosemary and Dome Theaters were destroyed (the later a $500,000 loss) and all the pier's rides and attractions. Only the sea end of Prior and Church's brand new Giant Dipper roller coaster remained.